The second of the stand-alone 'STAR WARS' anthology films (following 2016's 'ROGUE ONE'), about the early adventures of a younger Han Solo, as he meets Chewbacca and Lando Calrissian. The movie was directed by Ron Howard (who also helmed another George Lucas universe film, 'WILLOW'), and it was scripted by Lawrence Kasdan (a veteran 'STAR WARS' writer) and his son Jonathan. It stars Alden Ehrenreich (as Han Solo), Woody Harrelson, Emilia Clarke, Donald Glover, Joonas Suotamo, Paul Bettany, Thandie Newton and Phoebe Waller-Bridge. The movie has received mostly positive reviews from critics, and it's expected to break all kinds of records at the Box Office as well. Being a huge 'STAR WARS' fan, I was really disappointed with this movie. The story begins with Han (Ehrenreich) as a young smuggler, who desperately wants to start a new life for him and his lover, Qi'ra (Clarke). When he's separated from her, Han enlists in the Empire and becomes an expert pilot. He deserts his position and goes to work for a criminal named Tobias Beckett(Harrelson), with the hopes of making enough money to get back to Qi'ra. Along the way Han also meets Chewbacca (Suotamo) and Lando Calrissian (Glover), and he's also given the last name Solo. The film for me is the worst of all the new 'STAR WARS' reboot movies (at the least), it also feels the least like a true 'STAR WARS' film. That's definitely not to say that it's a bad movie at all. 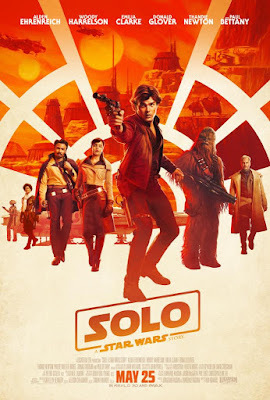 The action scenes are decent, and the performances are adequate; although I don't think Ehrenreich resembles what a young Han Solo should be at all (he's a good actor in other movies though, and I think he can be charismatic in the right role). I had hoped for so much more from a Han Solo origins story, that I can only possibly feel severely disappointed with what I got. I also don't think Howard can direct a quality film anymore (he hasn't in a long time). I really wish Disney hadn't fired the original directors of the movie too (Phil Lord and Christopher Miller); I think they could have delivered something much more magical, but now we'll never know.